Vacant houses are like lighthouses in the fog, they are beacons that attract every bad element in the neighborhood and beyond, including some neighbors that should know better. Ann at 89 years young, is old enough to know what Main St and Filbert in Stockton looked like in the 1940’s and 1950’s. She has stories and those memories are vibrant and passionate. She and her mother bought this little one bedroom one bath 285 sq ft house many years ago and rented it out trouble free for years. Then her Mother and then her husband passed away, and Ann boarded up the house when the last tenant moved out 9 years ago. Ann lost track of time and after the loss of her mother and husband Ann no longer wanted to be a landlord. She had contacted several real estate agents and was told that the house was just too small and that it needed to much work, it would never sell. It’s sad how listening to the experts is a self fulfilling prophecy. Ann believed them and was saddled with a house for 9 years that she could not afford to maintain. Maybe it was the timing and with all of the foreclosures clogging the system, Stockton real estate agents fleeing for other jobs and no buyers of distressed properties in sight, Anne was left alone to deal with the house. No one, not one real estate agent recommended that she call a cash home buyer like Westbrook REI. There were other things going on as well, her neighbors on each side decided that Ann’s property was the perfect dumping ground for all of the waste materials for the remodeling and building projects that they had going. It didn’t matter that other neighbors had watched them dump garbage and debris in her yard, the City of Stockton wasn’t going to provide any help for Ann, they were going to fine Ann and they started issuing Code Violations for the garbage and debris on her property and the tall weeds that had grown in between. It had gotten so bad that even the handyman hired to haul away all of the of the concrete and debris dumped by the neighbors onto her lot, started placing it all inside of her vacant house to avoid the dumping fees and in hopes that the code enforcement officer wouldn’t see it. That was until the vagrants broke in and started a fire. Finally the Code Enforcement officer told Ann that if she didn’t fix the house and all of its problems the City was going to pay a contractor to level the house and send her a bill. 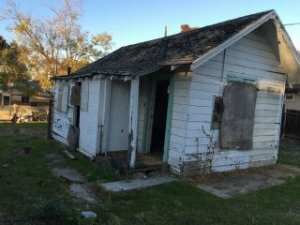 Keep in mind that the City of Stockton does not need to get bids for demolition of your house with code violations, it only need to establish a nuisance and you get to pay the bill. As Ann retells it, the Code Enforcement Officer was nice enough, but he told me that he was going to take my house away and I cant believe in this country they can do that. Ann was beside herself. It was so overwhelming that she had been victimized by her neighbors, vagrants and vandals. 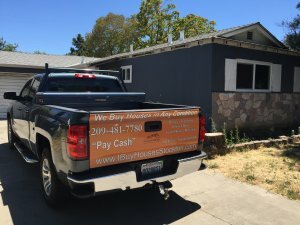 Unable to secure the house, keep up with all of the debris, repairs and maintenance and was now saddled with City of Stockton Code Violation that was one step away from a court order to fix the house or bulldoze it. The problem was that she didn’t have the money to do either and the City did NOT care. They wanted the problem gone. The Neighbors were complaining and the property had turned into a problem for everyone concerned. When Ann called me about selling the house she was interested making sure she had no residual liability after the house was sold and she was also interested in getting a fair price for the property. As you can imagine, her initial calls were very skeptical and yet we continued to talk until she felt comfortable with my ability to see the process through. Ann called several We Buy Houses Company’s in Stockton and selected Wesbrook REI because of price and experience. She told me that I was the only one that actually called the Code Enforcement Officer with her to ask questions and explain the answers. She was comforted that I knew the code enforcement officer personally and had worked with him in the past. The Code Enforcement Officer also assured her that he trusted I would take care of the problem and that I had always completed any projects he was aware of to the City’s satisfaction. To her credit Ann negotiated an all cash purchase that would allow her to walk away without and further liability and to close within one week of our agreement. In order to do that we needed to get the City Code Enforcement and health departments to abate any more fines and fees until we could submit a plan for the cleanup and repairs. 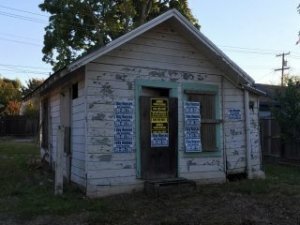 In the process the City approved the sale by transferring all code enforcement and health code violations to us as the new owners.